Schools have been identified as the single most important institution with potential to improve educational and health outcomes for young people. As a result, the Department of Health (DOH) formed a partnership with the Department of Education (DOE), University of Hawaii, and other community partners to promote nutrition, physical activity and tobacco-free lifestyles in school settings. This partnership continues to make advances in policy, environmental and systems changes that impact the majority of Hawaii’s children. In 2007, HHI worked with DOE staff as well as school and community stakeholders to develop the Wellness Guidelines. The Wellness Guidelines support a healthy school environment through nutrition criteria for food and beverages, health and physical education (PE), and professional development for staff. The Wellness Guidelines require that only healthy options are sold or provided to students at school or at school-sponsored events (e.g., vending machines, school meals, fundraisers, athletic concessions, and clubs). The Wellness Guidelines also reinforce the curriculum that is taught to students in the classroom. Hawaii’s Wellness Guidelines have been noted as one of the most comprehensive wellness policies in the nation. School compliance with the Wellness Guidelines is monitored through the annual Safety and Wellness Survey. For more information, see the Wellness Guidelines Toolkit. Recess Before Lunch (RBL) is a change in the traditional lunchtime schedule that allows students to be active immediately prior to eating lunch. National studies have shown that when schools incorporate RBL into the schedule, students consume more nutrients and waste less food. With greater nutrient intake, students are able to focus more on achieving learning goals in class. An RBL schedule has also been linked to improved student behavior on the playground and in the cafeteria. A Pilot Evaluation of Recess Before Lunch (PDF) at Kaneohe Elementary has demonstrated encouraging results. RBL is quickly gaining recognition in Hawaii schools as an effective lunchtime schedule with many potential benefits. Positive outcomes have included increased time for instruction, decreased number of students in the health room after lunch, and better recess participation. For more information, please see the Recess Before Lunch Toolkit (PDF). HHI has a longstanding relationship with DOE to support standards-based health and PE instruction in schools. HHI provides funds for state and district-level health and PE resource teachers across the state. These content area experts deliver professional development workshops, instructional resources and technical assistance to schools in order to facilitate implementation of health education, PE, and the Wellness Guidelines. Providing students access to healthy foods reinforces the knowledge and skills learned through health education. HHI has collaborated with DOE’s School Food Services Branch (SFSB) to develop healthy standardized recipes and provide opportunities for cafeteria staff training. These efforts have contributed to making the SFSB meals programs more nutritious. SFSB is responsible for serving more than 100,000 meals every school day. Almost half of public school students in Hawaii come from households that earn wages at or below 185 percent of the Federal Poverty Level and these children are eligible for free or reduced-price meals. In recent years, the SFSB has implemented major changes in the school nutrition environment to align with the Wellness Guidelines and comply with USDA requirements. For example, trans-fat is no longer used in the preparation or procurement of any foods. All grain items are at least 50% whole-grain and most are baked fresh daily in the individual schools. Milk options are 1% fat or skim and school vending machines only supply water. HHI is an active member of the Hawaii State Farm to School and School Garden Hui and supports the development of school gardens to increase opportunities for nutrition and cooking education, provide access to fresh fruits and vegetables, and develop positive social norms around healthy food consumption. 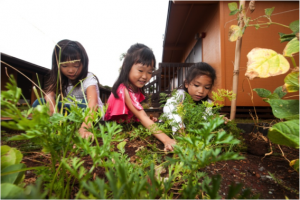 Evaluation of Hawaii school garden projects has demonstrated improvements in students’ knowledge, attitudes and behaviors related to the consumption of fruits and vegetables. 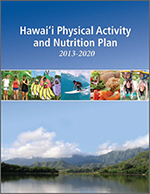 School gardens are included in the strategic objectives of Hawaii Physical Activity and Nutrition Plan, 2013-2020 (PDF). HHI works collaboratively with DOE, the University of Hawaii, and other state and community agencies to assess key student and school-level health indicators, coordinate school surveys, establish standard survey language and practices, develop summary reports, and disseminate findings. The resulting data provides trend information and guidance for school policy, program development and evaluation. The Youth Risk Behavior Survey measures health risk behaviors that contribute to the leading causes of death among Hawaii public middle and high school students. This includes: injuries and violence, alcohol and other drug use, sexual behaviors, diet and physical activity, and overweight/obesity. Similarly, the Youth Tobacco Survey collects data on tobacco use, access, initiation, cessation, knowledge and attitudes, and exposure to second hand smoke, also among Hawaii public middle and high school students. The Safety and Wellness Survey (SAWS) is used to monitor implementation of the Wellness Guidelines as required by Public Law 108-265, Sec. 204. It is an online survey that is jointly administered by the DOH and the DOE once per year, and completed by public school principals statewide. The survey is aligned with the five component areas of the Wellness Guidelines and includes an additional section of items used to evaluate school safety and wellness programs. 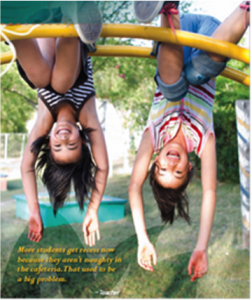 SAWS data are available in the Wellness Guidelines Toolkit and in the DOE Superintendent’s Annual Report. You may also download the report Implementing Wellness Policy in Hawaii Public Schools: School Year 2010-2011 (PDF).